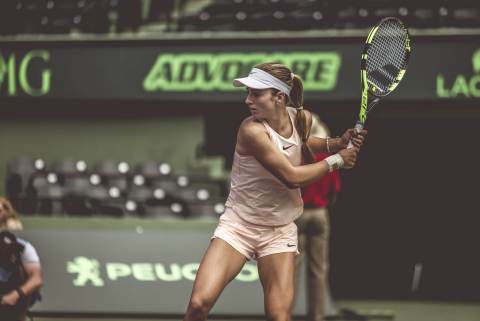 AdvoCare International, L.P., a health and wellness company, will host an after-school tennis clinic with AdvoCare endorser and Women's Tennis Association (WTA) player Cici Bellis at Shenandoah Park in Miami on Friday, March 22, from 4:00 pm - 5:30 pm. AdvoCare is proud to provide support in Miami as the official nutrition partner for the premier tennis event, the Miami Open, as well as by donating $10,000 to the City of Miami Parks and Recreation Department to help ensure children have a safe and healthy place to be active and exercise. "We're truly grateful to AdvoCare for helping introduce our local youth to the lifelong sport of tennis through one of its great young ambassadors, Cici Bellis," said Lara Hamwey, Director of the City of Miami Department of Parks and Recreation. "Our department shares AdvoCare's commitment to encouraging active play and good health among residents of all ages, and their generous monetary donation will help us to continue that important mission here in the City of Miami." "I am beyond excited to work with children from the City of Miami Parks and Recreation after school program at Shenandoah Park," said Cici Bellis, AdvoCare Product Endorser. "I love the idea that with my help, kids will be able to experience tennis in a fun, interactive way." "AdvoCare's mission is to truly make a difference in people's health and wellness, including our Foundation's focused mission to eradicate childhood obesity in the U.S. By involving our endorsers in exciting events like an after-school tennis clinic, it helps us see the real impact healthy activity can have on a community," said Allison Levy, executive vice president and chief legal officer at AdvoCare International, L.P.
At AdvoCare, We Build Champions® through physical and financial wellness. Backed by the most credible scientific research and internationally recognized Scientific and Medical Advisory Board, AdvoCare offers premium nutritional, weight-management and sports-performance products. In addition, AdvoCare empowers Independent Distributors with an industry-leading business opportunity and world-class training and business tools. AdvoCare is a family-owned company founded in 1993 and is headquartered in Plano, Texas. For more information about AdvoCare visit advocare.com. Connect with AdvoCare on Facebook, Twitter (News - Alert) and Instagram for latest news and product updates. Visit the Renew by AdvoCare blog for inspirational content featuring fitness and wellness tips, motivation, testimonials, recipes and more.